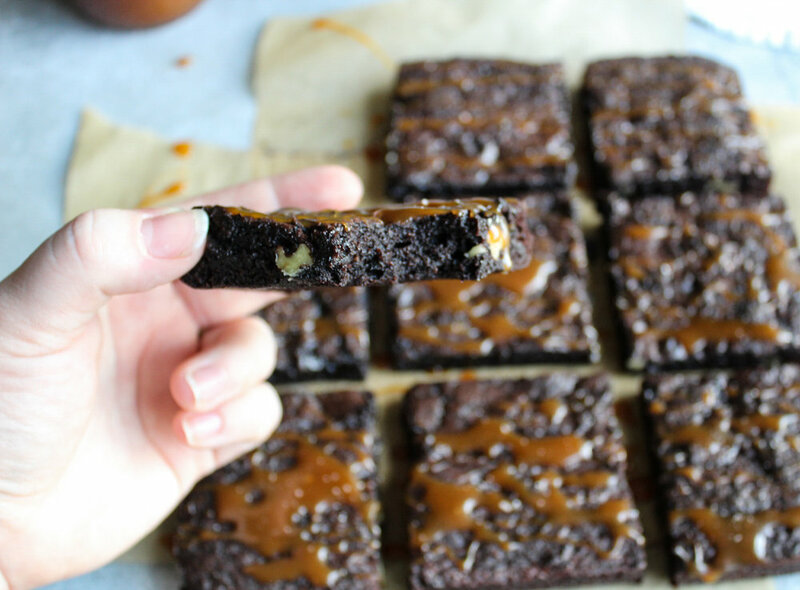 Fudgy Salted Caramel Brownies — South Fork Cake Co. I made these brownies on a whim earlier this week on a day that happened to be National Cookie Day, so I was like "hmm, I wonder if there is a National Brownie Day!" and guess what? There is and it's today! You know completely made up holidays in the name of baked goods are getting a little out of hand when there are two in one week, but who am I to ignore tradition?! The base brownie recipe is my go-to, super fudgy middle, chewy corners, absolute favorite from Cafe Delites (aka: the first result when you Google "fudgy brownie recipe"). You can see the recipe if you click here. This recipe is so rich and indulgent in the best way. My hot tip, would be to use good quality cocoa powder since the chocolate flavor should be the star of the brownie show. In my opinion, a crackly top and chewy edges really are the hallmarks of a good brownie and this recipe delivers. To dress these babies up a bit, I add a quarter cup of chopped toasted walnuts, but it's completely optional. I also add a healthy drizzle of my Vanilla Bean Salted Caramel Sauce, which is also technically optional... but let's be honest, I wouldn't go without it. Since I love salty/sweet, I also add a little pinch of salt on top.